Gender is not only something we wear but something we do. Gender is something we have learned. It is the manifestation of all the lessons we hold in our memory. Based on House of Larva’s devising process––which includes free-writing, somatics, theatre anthropology, and various other memory and movement-based practices–– participants use movement to explore the relationship between gender and power. Participants in our workshops will be invited to access memories in their body, physicalize gender archetypes, and explore House of Larva’s particular form of drag. If you are interested in hiring House of Larva to lead a “Genderbending Starts at the Skin” workshop, please contact House of Larva at cicadalamour@gmail.com. Fees around $75-$100 per hour-long session, but negotiable. 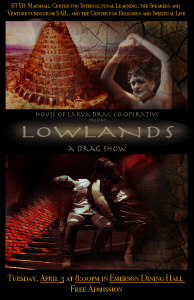 Full-length show, Lowlands, takes the audience into the tomb of the ancient civilization of bitchfaggots and back in time to witness the pact made between Empress Çicada L’Amour and the deity Admiral Benwa Breedwinner. Taking the audience on a tour of various debaucheries including conversion therapy, cannibalism, force-feeding, torture, ecstasy, and human sacrifice, the show explored themes of empire on the body, exoticism, orientalism, queer displacement, and borders in individual bodies and between bodies.